We proactively manage our clients’ deliveries, to reduce the likelihood of unforeseen shortage of fuel on site and short-notice orders/deliveries. 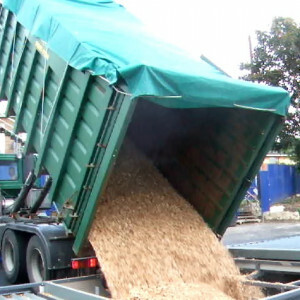 TreeStation woodchip deliveries options are as follow. We are happy to visit your site and provide advice on the most suitable delivery method for your existing installation. Tipped delivery (medium and large boilers): The majority of our deliveries are undertaken by our own tipping lorries, with capacities of 15 – 45 cubic metres. Larger volumes of up to 100 cubic metres can be organised. Chip can be tipped directly into a below-ground store or into an auger feeding an above-ground store. Craned bags (small boilers): We also own a HGV equipped with a crane to unload individual 1m3 dumpy bags for exceptional access circumstances. Hook lift bin swap (large boilers): Where design allows, we can also arrange to have a set of 2 hook lift bins swapped “empty for full” on a regular basis. We can also consider unusual delivery arrangements including domestic installations, please get in touch to discuss. When ordering, installing and commissioning a new system, it is critical to work alongside your potential woodchip supplier. By discussing storage design early on, you may be able to significantly decrease ongoing operational costs. An affordable increase in initial investment may result in a much lower Whole Life Cost, through optimisation of size, accessibility and delivery options. We are happy to discuss store design and sizing for your future installation, just get in touch. Why use TreeStation biomass chip?